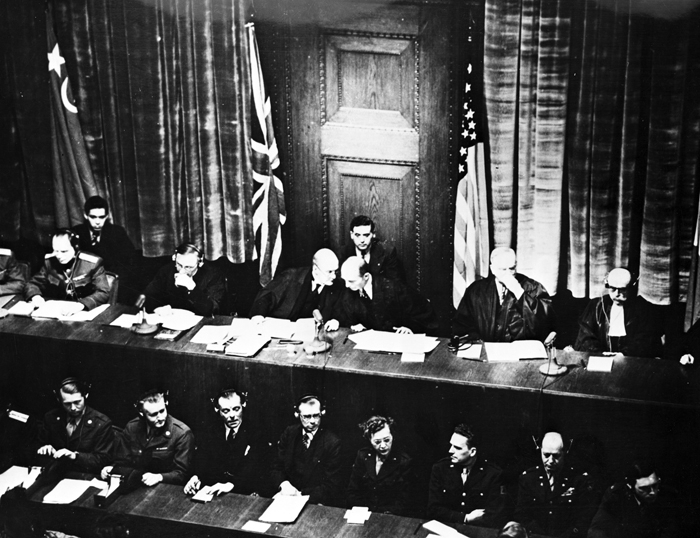 The trial of twenty-two major Nazio war criminals before the International Military Tribunal (IMT), took place from November 20, 1945 to October 1, 1946. The first two photos show the judges. In this photo, the judges are on the left, with secretaries and court reporters in front of them. The prosecutors' tables are center back, behind the lectern, and the press gallery is behind them. The middle table of prosecutors are the Americans, including assistant prosecutor Bill Miller, who later ran for vice-president with Barry Goldwater. His daughter, Stephanie Miller, is a progressive talk show host. This photo shows the war crimes defendants surrounded by military police, with their attorneys in front. For more information and names, see court diagram. 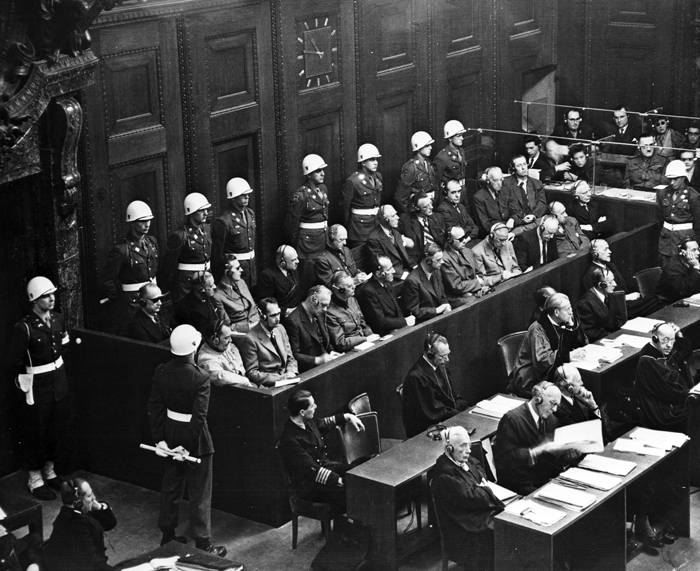 My father took the Nuremberg Trials photos when he was a twenty year old sergeant and aircrew member in the U.S. Army Air Force. Military records say he did basic training in Las Vegas April 2-June 23, 1945, joined the Army in Seattle November 15, 1945 (five days before the start of the Trials), departed for Germany February 3, 1946, and then returned to America December 7, 1946 (two months after the Nuremberg Trials ended). He was discharged from the Army several weeks later, February 11, 1947. PHOTOGRAPHIC CHIEF: SERVED WITH THE 42ND AIR DEPOT FOR TEN MONTHS. PERFORMED THE DUTIES OF A PHOTOGRAPHER WHILE ENGAGED IN WORKING WITH INTELLIGENCE AND OPERATIONS. DID A GREAT DEAL OF AERAIL AND GROUND WORK IN CONNECTION WITH MAKING TOPOGRAPHICAL MAPS. ALSO ASSISTED IN KEEPING A CHECK ON LINES OF SUPPLY. PREPARED AND MIXED SOLUTIONS, DEVELOPED FILMS, AND RETOUCHED NEGATIVES. ALSO DID A VARIETY OF INDOOR JOBS SUCH AS PORTRAITS AND PHOTOSTATS. SUPERVISED THE WORK OF 9 MEN AND LAB PERSONNEL. SERVED 10 1/2 MONTHS IN THE EUROPEAN THEATER OF OPERATIONS. The originals of these photos are held at the UCSB special collections library in Santa Barbara. The curator and I believe that these three photos were published in Army publications, and the Army allowed my father to take the internegs with him. The Army probably took all the out takes. Along with these three, we found hundreds of my father's photos of Germany from those years. We also found a self-portrait of my father hunched over his light table, labeled, "the big decision." We think he was referring to the choosing of three photos to publish from the dozens he took. After note: in October 2010, I had the opportunity to retrace my father's footsteps, visiting Ansbach, Nuremberg, and Munich. To see my photos of Germany, click here. This is a photo of Bill Muster photographing the Nuremberg Trials. 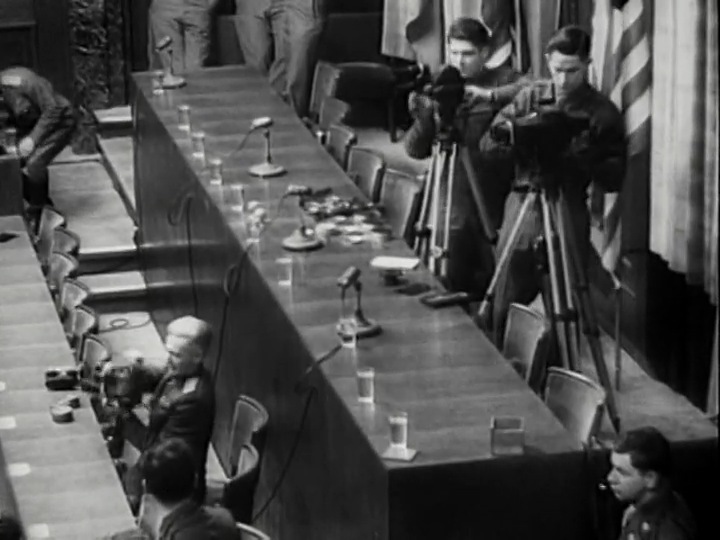 He was in the camera's view in this footage from the documentary, Nuremberg: The Nazis Facing Their Crimes, 2007, which was shot under the direction of John Ford. Bill Muster is the cameraman on the right. 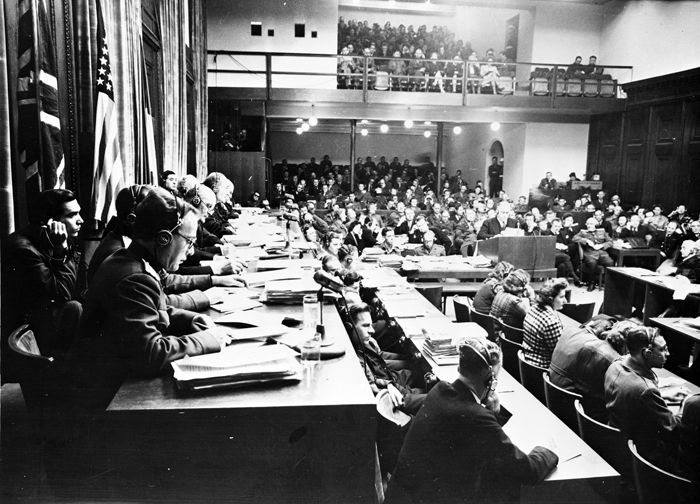 Bill Muster behind the camera at the Nuremberg Trials. You should watch it up until the point they bring in the construction of the film screen in the courtroom. If you stop there (about 20 minutes in) . . . In those first minutes you will see a lot of people with cameras, including some civilian journalists. A lot of the photogs are non-US; Russian, British, and French; even German military photographers were there. The narration (by the British actor Christopher Plummer) explains how the US took the lead for the whole operation, when no other country was so inclined. It was the first time in history that "Crimes Against the Peace" and "Crimes Against Humanity" were charged in a court of law. That is an American landmark of which we can truly be proud. These turned up recently in a box. 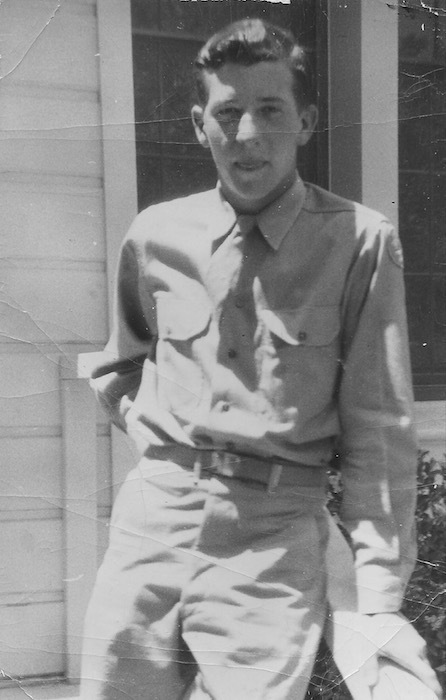 Bill Muster, Army Air Force, age nineteen. Probably taken in Las Vegas, basic training. Bill Muster, Army Air Force, age twenty. 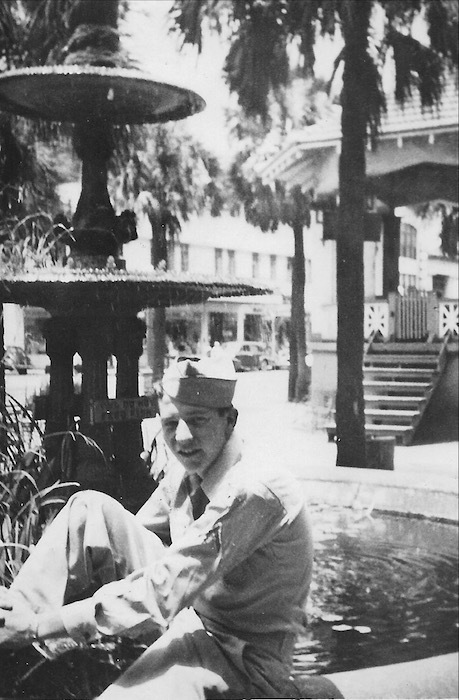 Probably taken in Ansbach, where he was stationed in 1946. To find more about Bill Muster at this site, click here.